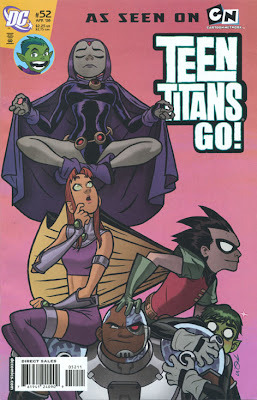 Issue 52 of Teen Titans: GO! came out today. You can peep my art on the cover, so keep an eye out at your local comic book store. Picked up my copy yesterday! Congrats again! Also, today is Superman's birthday. Any chance of him enjoying some cake too? Nice! Thanks for the support, dude! I didn't know about Superman! Thanks for the heads up. I'll look into procuring some Kyptonian themed delicacies. Hell yea man!!!! Congrats! Looks like wednesday will be a good comic book day! BTW, I was lucky enough to do my first comic cover for a major publisher. I did a collabo with Rob Liefeld for the cover of Cable #1. He penciled I painted. Check it out if ya get a chance, I'd love to hear your feedback! Congrats again man, any more covers in the future? If you liked Joe's cover for this issue, you're going to LOVE the art he did for the Beast Boy/Doom Patrol short story in the next issue! His BB is all kinds of cute, and the storytelling is amazing. Too bad they had to muck it up with some writer dude's speech balloons!